Nazareth is situated along the rolling hills of Galilee, sprawled with ancient olive trees, overlooking the Jezreel Valley. It is one of the oldest cities in the Holy Land. Archeological excavations in this region unearthed remains dating back to some 3,000 years ago.Nevertheless, during the first century, the era of the early Christians, it was more or less just a little village. During the time of Jesus, Nazareth was an unimportant place, but its fame grew rapidly after Jesus’ death. The first followers of Jesus were called Nazarenes. Today, the Hebrew andArabic designations to refer to the Christians, “Notzri” and “Nazrani”, are thought to be derived from the name of the city of Nazareth and for the many times that Jesus was called Jesus of Nazareth. However, the origin of this designation has been controversial for a long time. From the fourth century, scholars have noted the prophet Isaiah as the likely source of the term, as Isaiah spoke of King David’s shoot and the word “shoot” utilized by the prophet comes for the Hebrew word “netzer”. Thanks to archaeological research, we now know that the existence of Nazareth dates back to the second millennium before the birth of Christ. During the eighth century B.C., there settled a farming community that persisted until the second century B.C. This farming community is characterized by their constricted but simple houses that were fully or partially excavated on rocks. Traces of Christian worship predating the Byzantine periodhave been found in the place. These traces have two nuclei: the house of Mary and the house of Joseph. Each had its baptistery. On the site of the house of Marywas built a church during the fifth century but it was destroyed by the Jews in 614. In the year 722, the place fell into Muslim rule and the destroyed church was not rebuilt. During the era of the Crusades, when the Christians had reconquered Nazareth, Tancred built a basilica on the site of the house of Mary. The basilica was converted to a Cathedral in the year 1109 but in 1187 it fell again into the hands of the Muslims. 1240, it was retaken by the Christians but later, in 1263, it was destroyed by the Muslim governor Baybars after ordering the killing of several Christians. 1620, the Franciscans were allowed to settle in Nazareth to guard the site of the Annunciation. 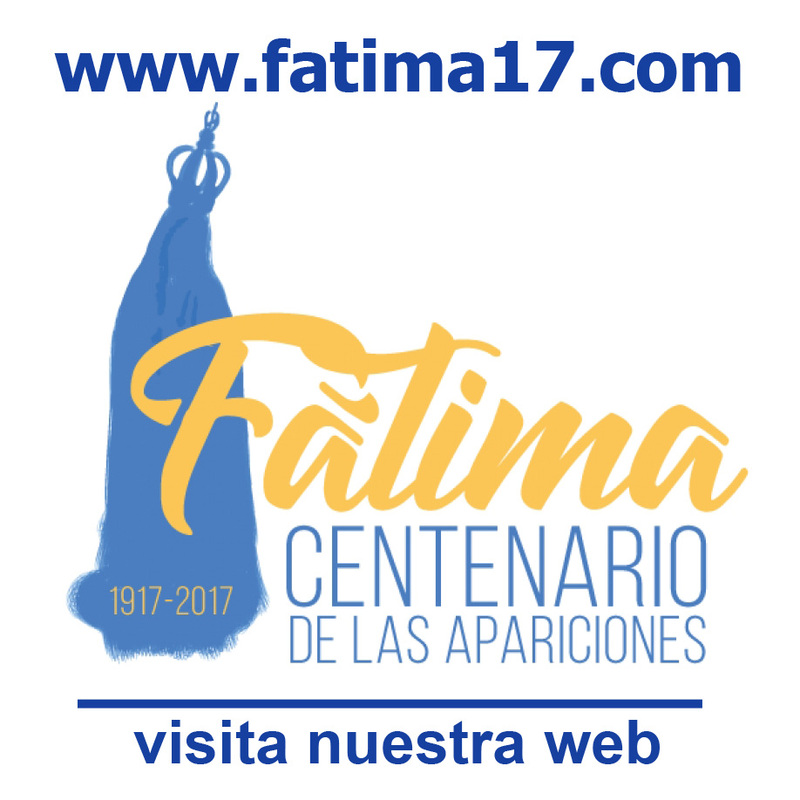 In 1955, the present basilica was constructed. 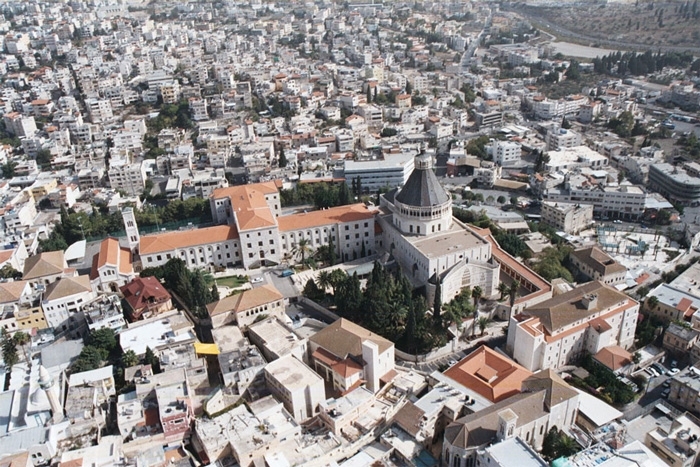 It is the biggest church in the modern city of Nazareth. It honors the Annunciation by the angel Gabriel to Mary that bears the message that she will be the mother of the Messiah. In the year 365 A.D., the empress St. Helena constructed a small shrine on the Grotto of the Annunciation. According to tradition, the grotto was part of the house of Mary wherein Mary received the message of the angel Gabriel. In other words, theIncarnation took place in that Grotto. One who may visit the Basilica would notice that the outdoor patiosurrounded by walls lined with light red and white rocks functions as atrium and cloister. On the main facade, the history of salvation in Jesus Christ is portrayed. Various biblical events are engraved on the bronze doors of the portico. The south facade, including its three bronze doors, is entirely dedicated to Mary. The interior of the basilica is divided into two superimposed churches: a church which is at the same level as the grotto and another church located on the upper level. The church located on the lower level highlights the Grotto of the Annunciation. The church is characterized by its sobriety that encourages reflection. Its sole decoration comes in the form of a stained glass window. Archeological investigations in the place have discovered an early pre-Byzantine Christian baptistery with paleo-Christian traces, along with Christian inscriptions and quadrangular columns of the cathedral that Tancred built. Numerous excavations during the 1950’s and the 1960’s revealed remains of a Byzantine mosaic floor and a stone column where the words “Ave María” of ancient origin is inscribed. A large quantity of polychrome stucco inscriptions (graffiti) characteristically Christian was also found and they demonstrate the Christian worship in the place during the first centuries. The grotto of the Virgin had undergone several transformations, including the stairs that come out on the northern side which were excavated by the Franciscansduring the seventeenth century to unite the grotto to the old convent. The passage of time is perceptible: on both sides of the grotto one can still see the remains of the column of the cathedral built during the time of the Crusades. On the other hand, above this church a baldachin, a gift of the Belgian kings Baudouin and Fabiola, hangs. The church on the upper part of the basilica, on the contrary, is very much ornamented, and it has a dome eighteen meters in diameter where the name of Mary is repeatedly inscribed. Everything here reminds of Mary, but in a special manner, the mosaic altarpiece depicting Jesus and Mary, and Peter with the keys, and they are surrounded by the hierarchical and charismatic Church. The chapel of the Blessed Sacrament, a gift from Spain, is decorated with a fresco depicting the gathering of the Eastern and Western Churches.The present church was built in 1914 on top of the previous church built during the era of the Crusades but since ancient times the memory of the Holy Family has been revered. Tradition says that this church stands over the carpenter workshop of the Holy Family. Little was left of the original house but traces of the cellar, cistern and theprimitive baptistery of the first Christians of Nazareth remain.